Priority deadline for the 2012-2013 JV year was March 1 (we are still accepting applications on a rolling basis, so get them in quick!) and area directors have been faithfully reading through pages of applications and having phone interviews with JV applicants ever since. For those of us in the JVC Northwest office, this season of interviews makes the office come alive with that unmistakable cubicle buzz—the excited chatter of area directors all conversing with potential JVs! The office is noticeably alive with the staff-side of conversations about the four values of JVC Northwest answering the most burning questions of applicants: What is living in community really like? How much is my monthly stipend? What does a “spirituality night” look like? 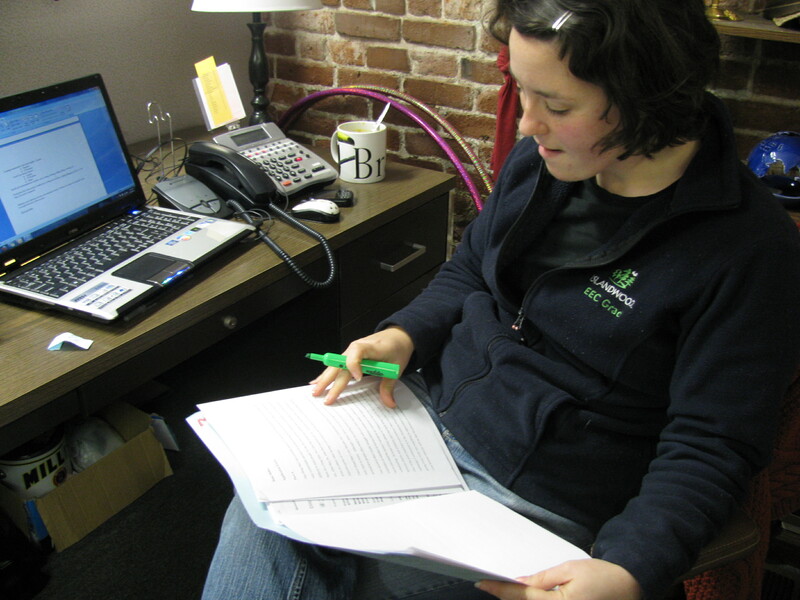 Susan, area director, shows us prep work required for an interview: always having a highlighter in hand when reading application essays (and a cup of coffee, just outside of view, never hurts either!). 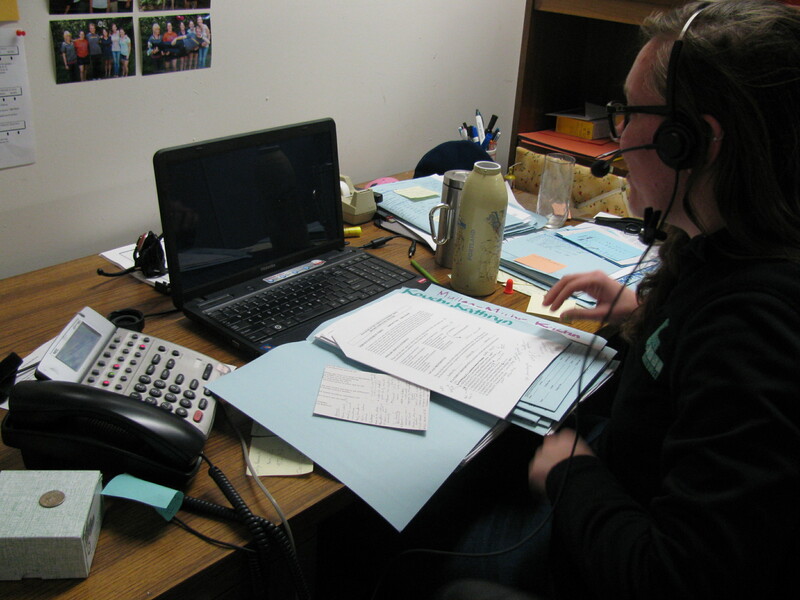 Megan, area director, with piles of applications in their blue folders spread across her desk and she sports a stylish headset, showing how the cubicle buzz brings a "call center" vibe to the JVC Northwest office. 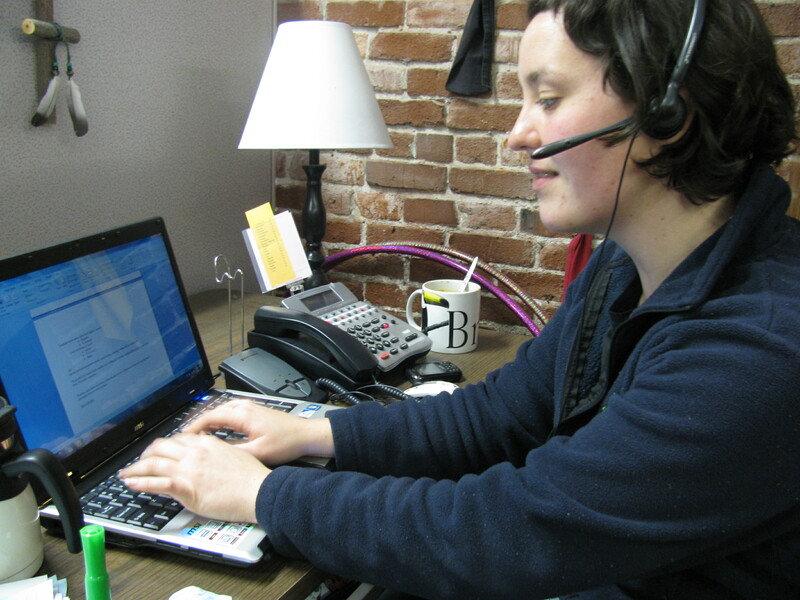 Susan, rocks the headset style while furiously typing notes during a JV applicant interview. If you stop and listen on the south-side of the office where interviews are taking place, you might hear responses from staff interviewers like, “It’s a really positive work environment at that agency. Many people have worked there a long time. Your non-profit skills will be a great fit, I think!” or, “We see limiting travel during the year as an opportunity for simple living and solidarity. Would it be hard for you to see your family and friends less often than you’re accustomed to?” Interviews are thought-provoking and the questions are sometimes challenging. The fresh energy of prospective JVs reminds us how awesome our jobs are and encourages us that the next group of JVs will also be ruined for life! We’re diggin’ your haircut out in St. X, Susan!